Thank you to Liz Steinglass for hosting Poetry Friday today! South Carolina has officially slid into a spring-like weather pattern, and I am not sure how I feel about this. Everywhere I look, trees are blooming and spring bulbs are poking up through the ground, and yesterday it was almost 80 degrees where I live! Seriously!! I am not sure how I feel about this…as much as I love springtime, I feel like we barely had a winter here. I hope that, wherever you are today, the weather is just the way you like it this time of year! Have a wonderful weekend! 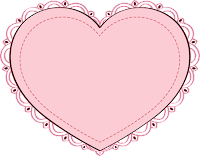 Thank you to Diane at Random Noodling for hosting Poetry Friday this week! 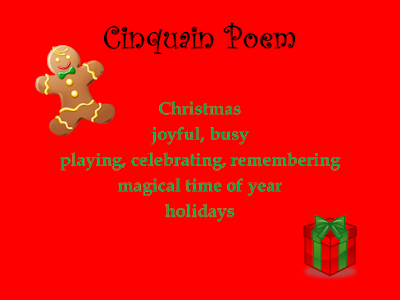 In my poetry presentations next week, I will be introducing elementary school students to different types of poetry and then they will write their own winter- or holiday-themed poems. 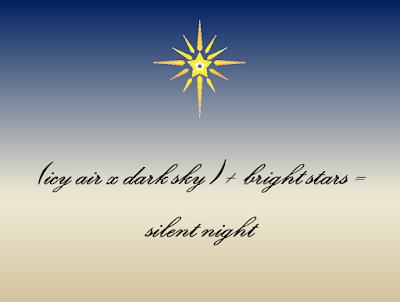 This presentation is one of my favorites and includes poems about different December holidays and the winter season. 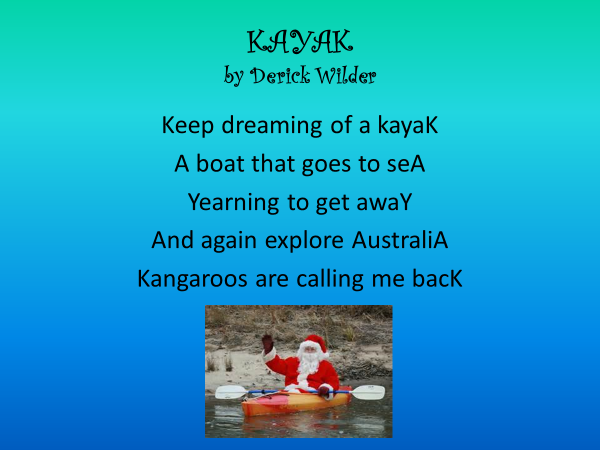 I look forward to sharing these poems with the kids every year! One of the types of poetry we will be exploring next week is the Japanese tanka. 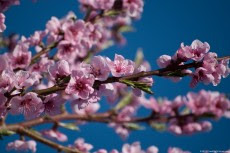 A tanka is similar to a haiku (but longer) and is also a poetic format that originated in Japan. Tanka poetry follows a 5/7/5/7/7 syllable format and was created to allow deeper emotional exploration than is possible within the shorter 5/7/5 syllables of haiku poetry. Below is an example of a Christmas tanka that I wrote to share with the children. If you enjoy writing haiku (which I LOVE! ), try writing a tanka poem today. It is a fun challenge and a great way to stretch your poetry-writing muscles! I hope you are enjoying all the fun festivities that December has to offer. 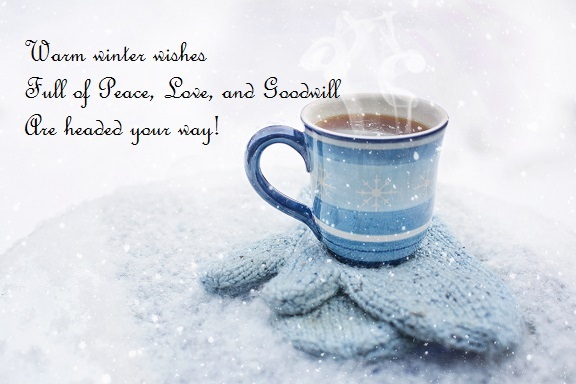 Have a beautiful holiday season, and Happy Writing! Thanks to Mary Lee Hahn at A Year of Reading for hosting Poetry Friday this week! November was a banner month for me. I traveled to Indianapolis to see my boys’ high school marching band compete at Grand Nationals (I am a proud tuba and trombone mom) and I surpassed my goal of 50,000 words in this year’s NaNoWriMo! Now I am busy preparing for holiday gatherings, church performances, and one of my favorite traditions—the December poetry workshop I do each year with local fifth graders. In our October workshop, we talked about the importance of the poetic tradition, had fun with rhyme scheme, and read lots of wonderful poetry. In just a few weeks, we will continue our discussion and I will introduce some more fun poetic formats. One of the fun forms we discuss each year is acrostic poetry. This format has been around a looooong time; acrostic poetry was discovered during the archaeological digs at Pompeii! The most common variation of the acrostic poem has a subject spelled out vertically in the left-hand margin, with each letter serving as the beginning of a word or phrase relating to or describing the subject. When it is time for the kids to write their own poems at the end of our lesson, many choose to tackle this particular challenge. It’s always fun to see what they come up with! I look forward to sharing more December poetry next week! IF YOU WRITE PICTURE BOOKS please keep reading! My talented friend and critique partner Tara Luebbe*, who has two picture books coming out this spring (SHARK NATE-O from little bee and I AM FAMOUS from Albert Whitman), is kicking off the second year of her Writing with the Stars mentorship program. Writing with the Stars is a (free) contest that will match 16 aspiring picture book writers/illustrators with 16 published professionals. Mentorships are available for authors and author/illustrators who are unpublished and unagented. I am super excited to finally be able to share this year’s incredible list of mentors, who are volunteering their time and talents to help aspiring picture book writers. Seriously, people—it is such an OUTSTANDING list! For more information, visit Tara’s website here. You can also follow Tara on Twitter at @t_luebbe. Please feel free to share this with any picture book authors or author/illustrators that you know! * Yes, I know—I have some rock star critique partners! April is one of my favorite months because it is National Poetry Month, an entire month to celebrate POETRY! Since 1996, poets and poetry lovers around the world have participated in this annual celebration, spearheaded by the Academy of American Poets. 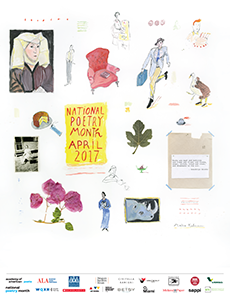 Click here here for more information about this year’s National Poetry Month festivities. Happy Spring, and Happy Writing! 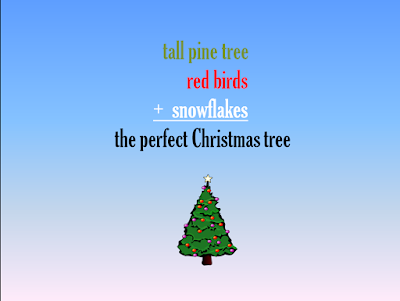 POETRY FRIDAY: Holiday Math Poetry and a NEW CONTEST for PB Writers! With a little over a week to go before Christmas, life has been a crazy whirl of holiday programs, concerts, parties, and shopping (the wrapping will commence soon☺). School will be OUT in just a few days, so in honor of the upcoming break from all things scholarly, I am sharing a few math poems that I wrote. I’ve posted about math poetry previously (click here for more on this fun poetic format), and these holiday-themed poems were particularly fun to write! These talented picture book professionals are volunteering their time and will each choose one very lucky person to work with for a three month period. 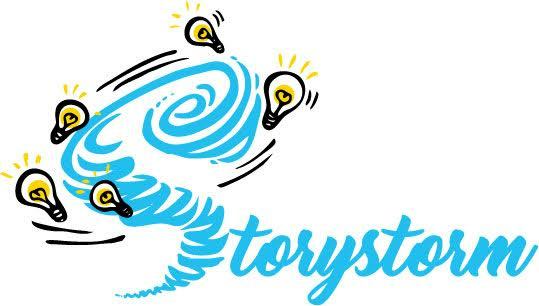 For more about Writing with the Stars, visit Tara’s website here and checkout the Twitter buzz at #PB WWTS. Applications will be accepted January 13-16 and I will post an interview with Tara the first week in January. In the meantime, follow Tara on Twitter @t_luebbe and read this fabulous interview with Tara by Johnell Dewitt! Enjoy these crazy December days, have a wonderful weekend, and Happy Writing! 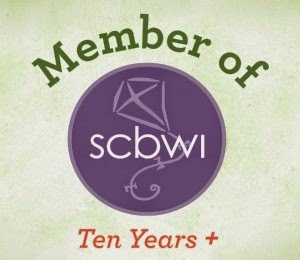 Thanks to Bridget at Wee Words for Wee Ones for hosting Poetry Friday this week! 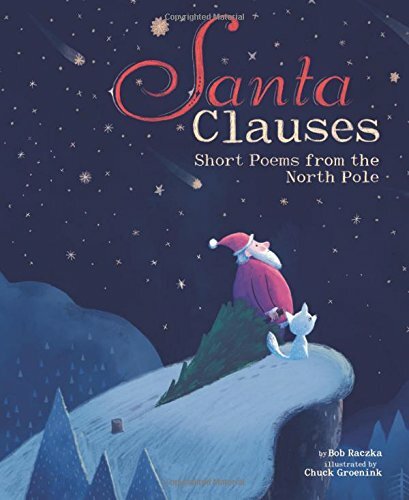 A few years ago I read about Bob Raczka’s book SANTA CLAUSES on another writer’s Poetry Friday post and had to buy a copy for myself. 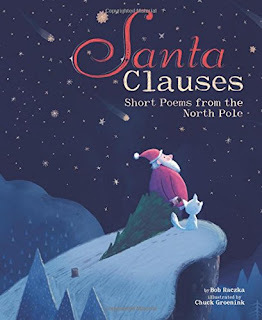 I was definitely not disappointed—this delightful book gives young readers a peek into the hectic life of Santa and Mrs. Claus as they prepare for Christmas. 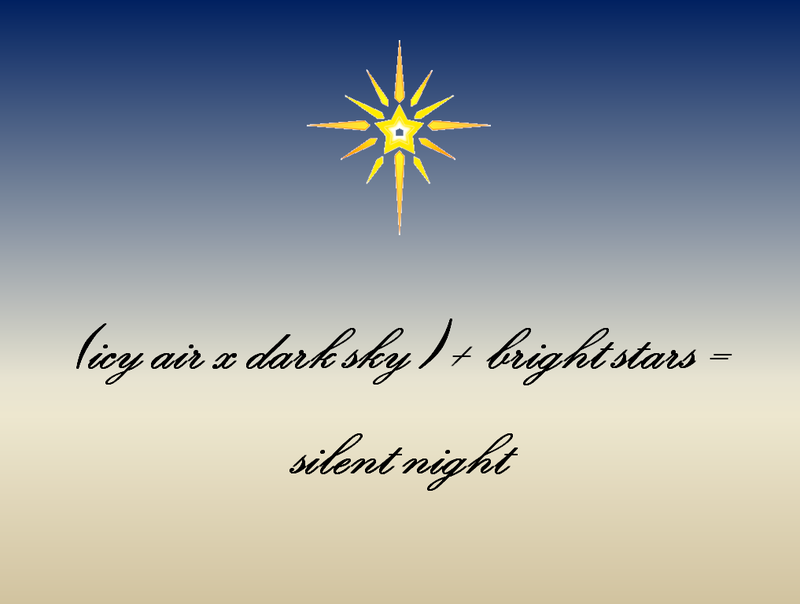 Beginning on December 1, each day is chronicled with a haiku, and the separate poems combine to tell a bigger story that ends on Christmas day. It is a wonderful concept and I look forward to sharing the book with young poets this holiday season! The idea of telling a bigger story through multiple haiku poems is intriguing to me. Haiku is one of my favorite types of poetry because it presents so many opportunities for the creative mind to play. Its simplicity can be deceiving—some of the most profound poetry I have come across has been written in haiku.